SAN ISIDRO, Northern Samar- Mayor Ferdinand ‘Nanding’ Avila disclosed that more programs and projects should be expected by his constituents as he mentioned the accomplishments of his administration during a speech he delivered during the 64th founding anniversary of the town on June 20 which was marked with several activities to enlighten the event. “Over the years that I’m in the public service, surely, we are heading towards many challenges but I know, we can sustain it all towards our one dream-for the betterment of our beloved San Isidro,” the town mayor said during the anniversary night celebration held at the public’s covered court attended by other town officials and newly-elected barangay and youth officials. Also present was former governor Paul Daza, representing his father, Rep. Raul Daza. In his anniversary message, Mayor Avila detailed all the projects and programs, dubbed as Health, Education, Agriculture, Revenue generation, Tourism and Sports (HEART), his administration has so far accomplished. 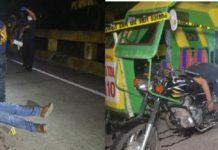 These include the construction of farm-to-market roads in the villages of San Juan and Palanit; a newly-purchased ambulance; a newly-constructed fish port in Barangay Buenavista; fish landing in Brgy. San Juan and the newly-rehabilitated municipal port together with the construction and installation of street lights in the whole municipality. He also mentioned of the ongoing construction of a slaughterhouse and material recovery facility. And on his solid waste management disposal, after a thorough study from his solid waste management technical staff, instead of a segregation policy of trash, his administration is now readying for the acquisition of a ‘gasifier’ equipment, among others particularly of his plan to acquire bus for needy- students coming to and from to far-flung villages to their school and a rescue vehicle and the ongoing renovation of their health centers. Mayor Avila, who is serving on his first term, said that he is pushing for more investors to come to the town to generate employment opportunities for his people. The night also marked the mass oath-taking of the newly-elected barangay and Sangguniang Kabataan officials coming from the 14 villages of the town with Mayor Avila and board member Joma Vicario as administering officers. Meantime, town Councilor Conrado Avila Sr. served as the inducting officer of San Isidro’s Municipal Tourism Council. 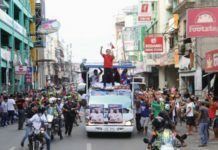 Among the activities that were lined up relative to the 64th founding anniversary were a fun run attended by representatives from different sectors; a grand parade which included a street parade and float competition on June 14. There was also painting exhibit, agri-livestock, ‘tabuan’, night food market and children’s game, medical mission, to include giving of anti-rabies vaccine, basketball, motorcade and bangkarera competitions as well as ‘bikini’ open.